Imja Tse is one of the most famous climbing peaks in Nepal. It stands in the Everest Region, reaches a height of 6,189m and is popularly known as Island Peak, a name given to it by Eric Shipton’s party in 1951, as the peak resembles an island in a sea of ice when viewed from Dingboche. Later in 1983, the peak was given the Nepali name Imja Tse. The peak was first ascended in 1953 by a British team as part of their preparations for climbing Everest. Tenzing Norgay was one of the members of the first ascent team. The peak is actually part of the south ridge of Lhotse Shar and forms a semicircle of cliffs that rise to the north of Nuptse, Lhotse, Middle Peak and Lhotse Shar. Expeditions to the peak can either go by road to Jiri and then by trail to Solu Khumbu or fly to Lukla. A day’s trek from Lukla takes you to the entrance to Sagarmatha National Park. Another day’s trek reaches the town of Namche Bazaar, the gateway to Everest’s base camp. The best idea from here is to continue to either Everest Base Camp or Kala Pattar, at 5545m, from where there is a famous view of Everest. Either trek is good for acclimatizing before the climb of Island Peak. One very good trek for acclimatizing is to walk along the Gokyo valley, then to cross the Chola pass, visiting both Kala Pattar and Everest Base Camp, before moving on to Chukhung. From there a 5-hour trek reaches Island Peak Base Camp at 5200m. The camp is in a small valley with Island Glacier on the right. From Base Camp we climb steeply up to 5500m – the climb takes about 3 hours – and set up a high camp. From there the climb is rocky at first, then across a glacier, with crevasses, to reach a final steep ascent to the summit. Ropes are fixed for the final summit climb. After breakfast we drive for the sightseeing in Kathmandu valley including, Kathmandu Darbar square, Swayambhunath Temple , Boudhanath Stupa & Pashupatinath Temple. After breakfast, we get transferred to the domestic terminal of Kathmandu airport for an early morning flight to Lukla (2,800m), a gateway destination from where our trek starts. After an adventurous 40 minute flight above breathtaking green and white mountains, we reach the Tenzing-Hillary Airport at Lukla. This is one of the most beautiful air routes in the world culminating in a dramatic landing on a hillside surrounded by high mountains peaks. Here we meet our other crew members and after some packing and arrangements, we start our trek through the prosperous village of Lukla until we reach Phakding. To assist in acclimatization, we only have a short hike today. However, if interested in additional activities we can take a side trip to a nearby monastery. Walking through a beautiful pine forest, the track leads us along the Dudh Koshi River through many suspension bridges, one of which is the famous Hillary Suspension Bridge. First, we catch wonderful prospect of the glistening Mt. Thamserku (6618 m). Through the settlement of Benkar, Chumoa, Monjo, we come to the check post and entrance to Sagarmatha National Park. We pass through the last village of Jorsale before reaching Namche Bazaar. The trail climbs through the forests and bridges until we reach the confluence of the Dudh Koshi and Bhote Koshi rivers. After a final steep ascent of about two hours we get first sight of Mt. Everest peering over the Lhotse-Nuptse ridge. We stop at Chautara to admire the view. We still need to hike about 1.5 hours to reach Namche Bazaar, a gateway to Mt. Everest and main trading centre of this region. This is the scheduled ‘acclimatization’ day for this trek. Health experts always recommend us to stay active and moving during the rest day too instead of being idle. We either spend the day taking a day hike and relaxing and exploring hundred vertical feet during the day, it will help us to properly acclimatize. Our guides will take us to the Tourist Visitor Center near the headquarter of the Sagarmatha National Park where we can observe an assortment of things related to the first Everest ascenders, Sherpa culture and learn about the various plant and animal life of the Everest region. We also take an interesting side trip up to Khumjung. We climb up to the famous airstrip at Syangboche. Just above the airstrip is the Everest View Hotel, a Japanese scheme to build a deluxe hotel with great views of the highest mountains on Earth. The Khumjung valley is surrounded by the snowy peaks of Kongde and Thamserku Namche Bazaar itself. Namche Bazzar is the main centre of the Everest (Khumbu) region and has government offices, ATMs, Internet cafes, shops, restaurants, a bakery and a colorful market each Friday evening and Saturday. If we trek a few and the sacred peak Khumbila, hosts a well known monastery that houses a yeti scalp. We also visit Hillary School which is at the same site. After having lunch and spending some time in Khumjung, we walk back down to Namche Bazza. After breakfast, we trek uphill. After an hour walking mostly downhill into the forest, the trip continues. At this juncture, the steep rise up about 50m in altitude to reach a ridge around it. The river bed becomes closer and wider. We reach the village of Phorte and then the small town of Samde along the stretch halfway up a slight slope leading to the bridge over the Bhote Koshi from here Thame is not far. Today after breakfast we head for the next camp towards Lungden. The terrain from Thame to Lungdeng is alpine zone and there is very less vegetation. We enjoy the peace and relative solitude of this little trekked valley. We next bend around the village of Tangmote. After then, we walk parallel to the village of Yellajung on the other side of the Bhote Koshi and then to Marlung and then climb a small rasing hill. Upon crossing the water stream we reach Lungdeng. After breakfast we leave Lungdeng and hike to the top of Renjo La, we get the outstanding views of the surrounding. The Everest itself, Lhotse, Cholatse and Taboche can be seen shining in the sun. We walk further to Gokyo. Today, we are on the trail to Thaknak. We climb out of Gokyo village to a ridge. Then, we take the route through the Ngozumpa Glacier to the mountain on the other side. Continuing further and traversing along the edge of that mountain, we descend down to Thaknak. On the trek, we enjoy the magnificent views of Cho Oyu, Gokyo Ri, and other high Himalayas. 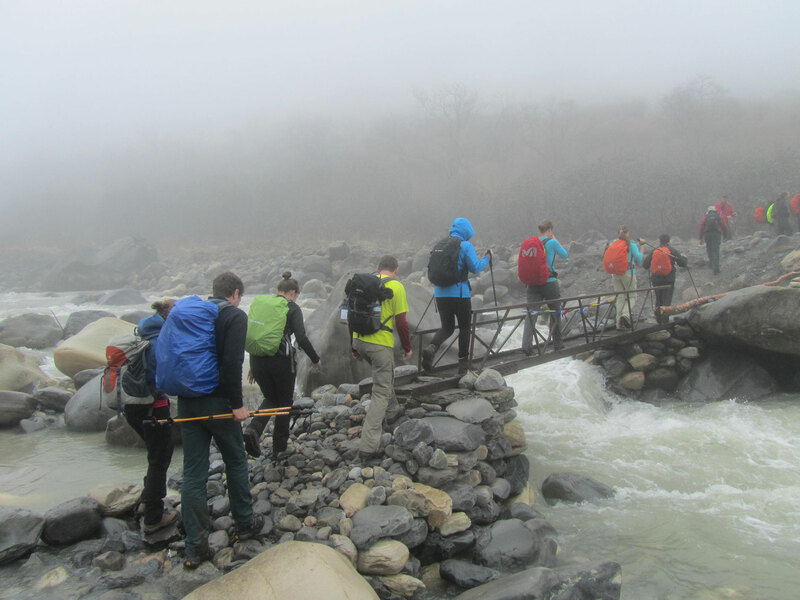 We trek to the Cho La Pass and and futher trek to Dzongla. We need to be careful as the trail is vertical and the rocks glazed by ice add trouble to the trekkers making the trail slippery. Our trail climbs through a ravine and a rocky trail. So, we climb up continuously up from Phedi. We trek through the side of a frozen lake while we come to the top of the pass decorated with prayer flags. We need to pass through some crevasses before we reach Dzongla, another beautiful place with a complete view of Mt. Cholatse, Mt. Ama Dablam, Lobuche peak and the Pheriche village far below. Beyond Duglha we trek up the steep terminal moraine of the Khumbu Glacier. We find our way through the boulder-strewn slope as we ascend Chupki Lhara, an eerie ridge top with dramatic mountains views. At the top of the ridge we will find an array of stones with prayer flags used as memorials to Scott Fischer (American mountaineer) and 10 times Everest submitter Babu Chiri Sherpa (mountain guide from Nepal) who perished on a mission to climb Everest. As the trail drops to the Khumbu Glacier moraine, we find ourselves right “in front of” several great peaks – Khumbutse, Lingtren, Pumori and Mahalangur Himal. We are now in the vicinity of Everest but the great mountain still remains hidden. Nuptse towers to the right as the trail crosses the Khumbu Glacier. As we trek along a murmuring stream we do not see the Khumbu glacier because of its lateral moraine wall and we now begin to feel a little out of breath due to high altitude. The trail to Gorak Shep goes ahead through the lateral moraine of the Khumbu Glacier. We pass though the pyramid sign post. Ahead on the trail we see crest of north ridge of Everest along with Mt. Pumori, Mahalangur, Lingtern, Khumbutse, Nuptse, etc. A small ascent would take us to Thangma Riju. As we reach Gorak Shep, we will be surrounded by snow-capped mountains looming all around us including the top of the world – Mount Everest. After a brief lunch and rest, we take the trail to Everest Base Camp through the once vast Gorak Shep.Lake and return back to Gorak Shep. Early morning, when the sun begins to rise over the Everest, we make our way to the top of one of the finest viewpoints in the Khumbu, Kala Pattar (5554m) from where, we can have close and fantastic views of Everest including nuptse, loptse then we turn back to Lodge, after breakfast, downhill to Luboche. After breakfast we trek to Chukung via Khumbu Glacier and Kongma base camp and continues ascending to Kongma pass the ascend is difficult part of our trek today. After gaining the Kongma La, we see cairn wrapped in prayer flags,-marks of the pass. Then we descend a gradual walk up the ImjaKhola valley to Chhukung, a small summer settlement. Today, the path from Chhukung leads fairly steep way climbing south then turning east to the main line of the valley, and then winds along or below the southern flank of the moraine from the Lhotse Glacier. We continue short pleasant walking along a streamside. The route to the AmphuLapcha lies to the southeast. After lunch, our guides will provide training on peak climbing techniques and using climbing gears such as ice axe, climbing boot and crampons, harness, ascender, etc and on how to go up and down using ropes. Although it is not mandatory to have prior training experience for Island Peak Climbing, we believe that some training experience will boost up your confidence and climbing skills to increase the chances of scaling the summit as well as to fully enjoy the experience. Today is our hardest day; we begin our climb early in the morning, generally around 1 AM. In the beginning, we climb the rock gully. This is not difficult but there are several short rock steps to climb before we emerge on the right side of the gully. The route then follows a ridgeline, which leads to an exhilarating and exposed traverse onto the snout of the summit glacier. We need to rope up for the glacier as it contains several crevasses. The guides will fix a rope wherever necessary. A steep snow slope leads us onto the summit ridge. After enjoying the summit views, and taking pictures, we descend all the way to Chukung. Today’s trek is mostly downhill, we cross the Khumbu Khola on a wooden suspension bridge and follow the ImjaKhola to the village of Pangboche then continue to fallow the river and after crossing it, climb through birch and rhododendron forest to Tenboche, from there we can have a best views of Kuwangde, Everest, Amadablam, Thengboche is known as a famous monastery, where we can do mediation. We will trek down through the hillside blanketed by rhododendron and juniper trees. If it’s spring, pink and red rhododendron flowers ablaze our surroundings. Depending on our hunger and condition, after crossing the prayer flag festooned bridge over the DudhKoshi River trail then follows the DudhKoshi gorge descending rapidly through the pine forests. The path eventually reaches Sansa which is the major trail junction in the region. We stop at Kyangjuma (3570 m) for a relaxed lunch. Following lunch, the trail to Namche Bazaar clings to the steep wooded slope beyond Kyangjuma, winding through several bends. After passing a Chorten, we reach the army camp at of Namche Bazaar. We want to take a long last look (and picture!) back to Lhotse, the tip of Everest and Tengboche from here. On reaching our lodge, we take a nice hot shower and have very relaxed sleep in our room in Namche Bazaar. Early in the morning after breakfast slowly we cross the suspension bridges over the fast flowing DudhKoshi and its tributaries the trail becomes more level and natural. By today we start to get warmed up by the light breeze. Any remaining sore throats and colds will be gone by today as we pass through this charming mountain air. Although we are travelling the same route down, we feel completely different views. We snap a mixture of open plains, rhododendron and pine forests, and in the distance snow covered peaks. We walk through the Sherpa villages’ noticing impressive faith in Buddhism and culture of prayer stones and prayers flag while we walk through the villages. On arrival in Lukla, we stretch those sore legs and recall the experiences of the last couple of weeks. We experience the culmination of a fantastic trek on a happy note with everyone back safe and sound with smile on their faces. We fly back to Kathmandu after our long mountain journey. The early morning flight drops us at Kathmandu. You can rest and relax throughout the day in your hotel.